This crocheted placemat pattern lets you practice your newfound crocheting skills while at the same time creating a colorful set of placemats. 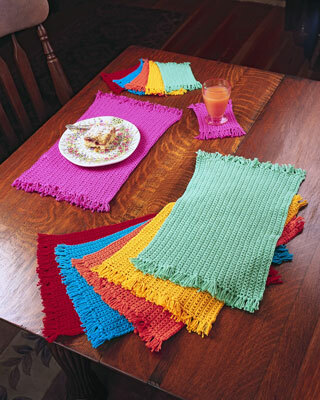 These crocheted placemats are a great way to add some happy color to your table. Hook: Standard crochet hook size H-8 U.S. or size needed to obtain gauge. Gauge: 7 sts and 8 rows sc = 2 in. Create your foundation chain by working 57 chain stitches in a row. To complete Row 1, work 1 single crochet stitch (sc) in the second chain from the hook, then work 1 single crochet stitch in each chain across the row. You should have 56 complete single crochet stitches. Turn your work, then chain 1 for the single crochet turning chain to prepare for the next row. To complete the next row, work 1 single crochet stitch in each stitch across the row. Repeat Steps 3 and 4 until you have 42 rows on your work. Cut some of the remaining yarn into 3 1/2-in. lengths. Using 2 strands of yarn held together as one for each fringe, single knot 1 fringe in each stitch across each short edge of the placemat.